Riddhi Roll Compactor is designed for the densification and granulation of powder for the pharmaceutical industries in particulars and food and chemical industries in general. 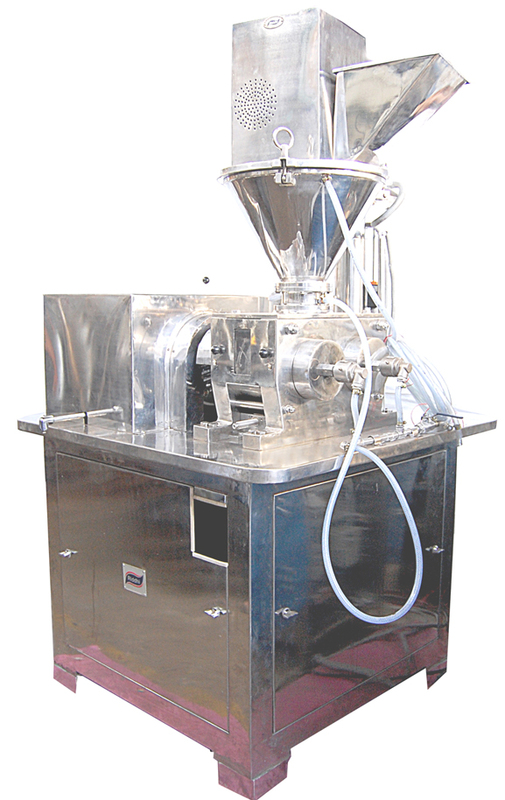 It is also ideal for batch or continuous processing variety of materials. By virtue of its construction and design, it ensures easy and quick clean-up and is most ideal for quick product change-over and also prevents contamination from one product to the other. Riddhi Roll Compactor is available in two models plain and water jacketed, water jacketed model is widely accepted model due to heat sensitive products which can be compacted without distorting its physical and chemical properties. Hot and cold water or liquid or steam at low pressure can be circulated for absorbing or discarding (ejecting) heat from the product. Jacketting is provided in all process sensitive area like rolls, bowls hopper. 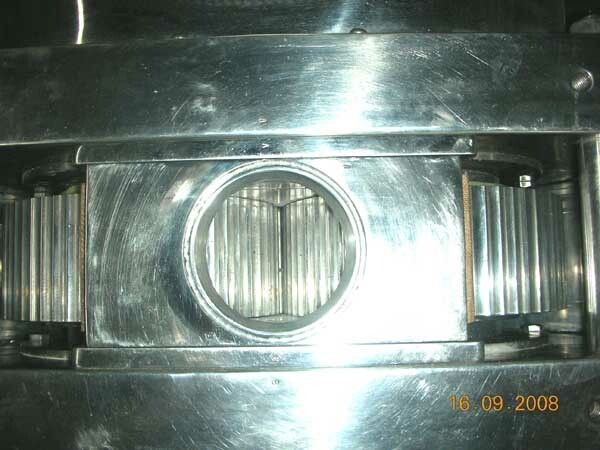 Quick release coupling are provided with non-return valve to aviod spillage of water/liquid while taking hopper & bowl for cleaning & sterilization. 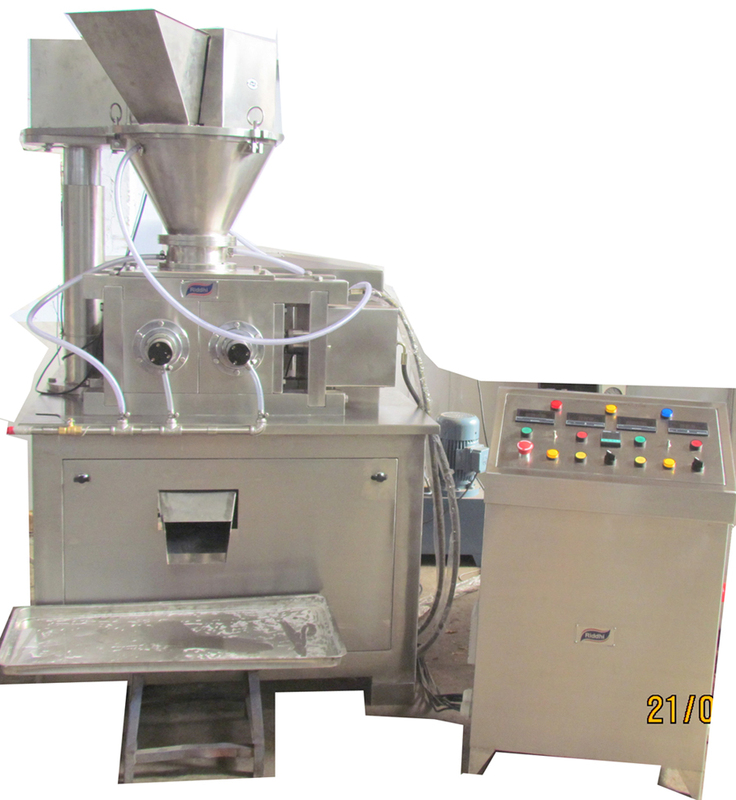 Riddhi Roll Compactor RDRC 200/50 & 200/75 are GMP models. Totally enclosed with SS304 cladding and frame work - ease of cleaning. Very Compact Design available in plain, water jacketed or flame proof model. Screw is driven through variable drive safety sleeping clutch between gear box and feed screw. Rolls drive through twin shaft gear box with speed drive unit coupled to it using a flexible coupling which ensures synchronization of the roll with a steady torque loading. Feeding device and sealing of roll by means of check plates and all parts which are exposed to wear are made of hardened steel. The compacting head is two piece assembly for easy dismantling. Pre-densifier screw comprises of cylinder or conical shape which is well polished and made of AISI SS-304 quality material. Compacting rolls sleeves are made out of tool steel, hardened to 55 HRC approx., & are keyed into shaft & thus protected against axial slipping by thrust plates & bolts. The feed screw assembly can be hydraulically lifted by hand - operated hydraulic pump. This facilitates ease in cleaning. Scrapper Assembly so designed to dismantle for ease of cleaning. Pre-Compression chamber guides the powder without any slippage or leakage. The main roll drive & feed screw are electrically interconnected. All controls and indicators of the compactor are permanently built-in namely, on/off rolls, on/off feeds screw, main switch forward / reverse switch, ammeters for rolls & feed screw & emergency stop. Roll Drive Motor 5 HP. 3. A.C. 5 HP. 3 . A.C.
Feed Screw Drive Motor 1 HP. 3. A.C. 1 HP. 3 . A.C. Roll Drive Motor 7.5 HP. 3. A.C 10 HP. 3. A.C.
Feed Screw Drive Motor 3 HP. 3. A.C 3 HP. 3. A.C. Roll Drive Motor 1.5 HP. 3. A.C.
Feed Screw Drive Motor 1 HP. 3. A.C.